Since the close of the Second World War is now more than six decades in the past, even the younger surviving participants in that war are well into their seventies and eighties. Consequently, first-hand memories of that greatest war of the modern era are quickly fading. The general history is, of course, preserved in books and various film documentaries and will therefore not be forgotten. Yet, many of the more obscure events of those grim years – events that serve to expose the conflict's hidden causes and lamentable aftereffects, and that provide salient lessons for the future – are dropping from view with the pasage of time. Let us consider the case of the Serbian freedom fighter General Draza Mihailovich, and of his rescue of more than 500 American and Allied airmen during the air offensive against German military targets late in the war. By late 1943, the Allied conquest of North Africa, Sicily, and southern Italy provided bases for American bombers to strike German industrial targets previously beyond their reach. But the bombing campaign was costly in both men and material, the Luftwaffe fiercely defending the airspace over the German homeland and German occupied countries. The first bomber raid on the Romanian oil fields at Ploesti, for example, cost the American Air Corps 54 planes and 532 airmen. Often, bombers damaged by flak or shot to pieces by Luftwaffe fighters struggled to return home, but could not make it the whole way. Since the flight back to bases in North Africa or Italy carried the planes over Yugoslavia, many were the men forced to parachute into the mountains of that rugged land. Although some were promptly captured by the Germans and dispatched to POW camps, others were blessed to land in the craggy regions dominated by the Chetniks, the Royalist resistance fighters of General Draza Mihailovich, who had refused to surrender when the Germans invaded in April 1941 and instead withdrew into the highlands of Serbian to continue the fight. What Mihailovich was saying was that the Americans were his number one priority, a priority above even that of the general's own fellow countrymen. Indeed, the Royalist Chetniks were a resistance force to be reckoned with, the largest resistance army on the German-controlled continent. But that force could never hope to defeat the Germans by itself . America and Brittain, Mihailovich was convinced at the time, offered the only hope of the restoration of an independent, free Yugoslavia. Tragically, America and Brittain were deceived by communists agents within their own ranks, who sought to besmirch the reputation of Mihailovich by circulating the outrageous lie that he was collaborating with the Germans, while assuring everyone that the rival communist Partisan leader, Josip Broz Tito, was the true friend of the West. This was confirmed beyond question in 1997 when, as the author shows, declassified British documents revealed that a Soviet agents, James Klugman, “was principally responsible for sabotaging the Mihailovich supply operation and for keeping from London information about how much Mihailovich forces were fighting the Germans and how much successes they were having.” Upon reaching America, that disinformation was amplified by Soviet agents in key positions within our own government. Because of Klugman's activities, supplies were recounted to Tito, thus assuring the post-war communist takeover of Yugoslavia. Yet, despite this horrifying volte-face, General Mihailovich remained faithful to his Western Allies, not only assuring the safety of the 500 airmen, but assisting in “Operation Halyard,” the extremely perilous airlift operation that returned all the men to Allied-controlled Italy. At the conclusion of the war, Tito seized control of Yugoslavia and, upon capturing General Mihailovich, put him on trial for treason. The trial was, of course, a blatant farce in which propaganda replaced hard evidence, as Freemen abundantly demonstrates. Many of the rescued Americans, indignant and heartbroken at this treatment of a genuine hero, volunteered to go to Belgrade to testify for the Chetnik leader, but were denied permission to enter the country. To the American request, Tito responded in typical communist doublespeak, “The crimes committed by Mihailovich are too great and terrible for any discussions to take place on whether or not he is guilty.” Among these “crimes” was Chetnik opposition to communism, needless to say an inherently treasonous act in the eyes of Tito. The American veterans, having been banned from Yugoslavia, formed a “National Committee for the Defense of Draza Mihailovich and the Serbian People”, distributing literature and seeking publicly for their cause in the American press. Yet though successful to some degree in influencing American opinion, the efforts were for naught insofar as Tito was concerned. No one was surprised, therefore, when Mihailovich was found guilty and, 48 hours later, stood before a firing squad. Two years after the scandalous mock trial, elements in the American government came to realize its wartime error, posthumously awarding General Draza Mihailovich the Legion of Merit, the highest decoration given foreign nationals by the United States. But even at that time, Freeman writes, there was fear on the part of the spineless officialdom that the award would offend dictator Tito, and so, astonishingly, it remained a classified secret until 1967, when it was finally made public. Only in 2005 was the Legion of Merit presented to General Mihailovich's daughter, Gordana Mihailovich, by that time a retired physician, 78 years of age. The author relates that she wept when the medal was handed to her, and she then kissed a photo of her long-dead father. The presentation received scant coverage in the world press. 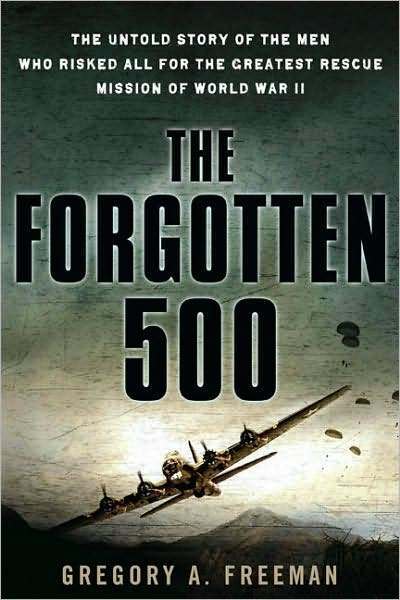 The Forgotten 500 is subtitled The Untold Story of the Men Who Risked All for the Greatest Rescue Mission of World War II. It is the “untold story” that is here told at last. Conveyed primarily from the point of view of the Americans sheltered by General Mihailovich or involved in the rescue operation, it is a gripping narrative, dramatically brought alive and filled with suspense and excitement. One feels the frustration of men determined to recover the trapped Americans but repeatedly thwarted in their efforts by duplicaitious government functionaries, and the elation when the airmen are ultimately brought to safety. The book is enhanced by endnotes and a comprehensive bibliography. A short postscript: most of the downed servicemen rescued by Mihailovich during the latter years of the Second World War regarded America's abandonment of this loyal ally as an unqualified betrayal. Unhappily, the betrayal continues. In 1995, a delegation of the same rescued men returned to the mountains of Serbia to commemorate the 50th anniversary of V-E day. There, they were greeted by 50,000 Serbs who cheered them and who chanted in unison, “USA! USA!” In few countries of the world were Americans more respected and loved than in Serbia at that moment. Yet, in March 1999, the United States launched a 78-day bombing campaign against Serbia to force it to abandon the province of Kosovo to Marxist KLA terrorists. Under NATO's protection, those terrorists promptly set about murdering innocent Serb civilians and dynamiting more than 100 churches and monasteries, many veritable jewels of Christian medieval art and architecture dating back to the 14th century. In February 2008, Kosovo, under the NATO-imposed control of KLA-sponsored regime, declared its independence from Serbia. Amazingly, the United States promptly recognized that action, although the establishment of a terrorist state in Europe clearly contributes to the rising tide of chaos in the world and is obviously contrary to America's own long-term interests. May God have mercy on us and forgive our country for its cynical and perfidious elected leaders!